Want a fun way to keep the kids’ geography skills sharp this summer, or maybe you're just looking for a way to kill a few extra minutes at work during the slow holiday week? 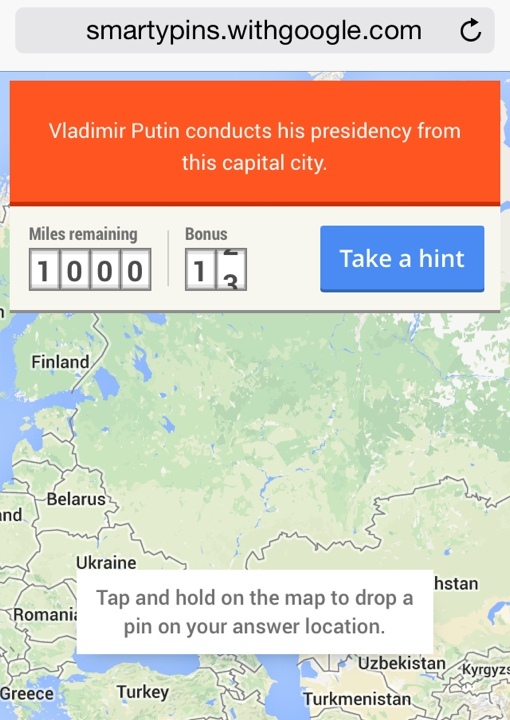 Then check out Smarty Pins, a new, free browser-based trivia game from Google Maps. The game is simple and, admittedly, pretty fun. You’ll need to answer a series of geography-related trivia questions that point you towards specific cities in the U.S. and world. But rather than simply type out the name of the answer, you’re tasked with locating the answer on the map by dropping a ubiquitous red Google pin. You start each game with a bank of 1,000 miles. The game measures the real-world distance you placed your pin from the actual answer, and subtracts it from your bank. Get the location exactly right and you’ll keep all your miles. You might even get a few bonus miles added to your score for answering before the game gives you a second clue to the mystery location. Smarty Pins lets you choose your own category of trivia questions, from Arts & Culture (where must you travel to see the Mona Lisa? ), Sports & Games (where’s the Green Monster? ), History (can you pin point the start of the Revolutionary War? ), and Entertainment (you can find Dollywood on a map, too, right?). There’s even a timely World Cup Trivia category – a lot of fun if you’re a FIFA World Cup soccer junkie. Smarty Pins is a browser-based game, so there’s no software to download or browser add-on to install. Simply visit smartypins.withgoogle.com on your PC or smartphone to give it a try. Woo hoo! 24 points on my first try! Who can beat me?